Welcome back to the horror! Five Nights at Freddy's has returned for a second round in the sequel of roughly the same name, though you'll be kidding yourself if you think the experience will be a mirror of the previous game. Five Nights at Freddy's 2 is a decent bit tougher than its predecessor, and you'll have to work extra special hard to survive against Freddy and his pals. Aaaaaall eleven of 'em. 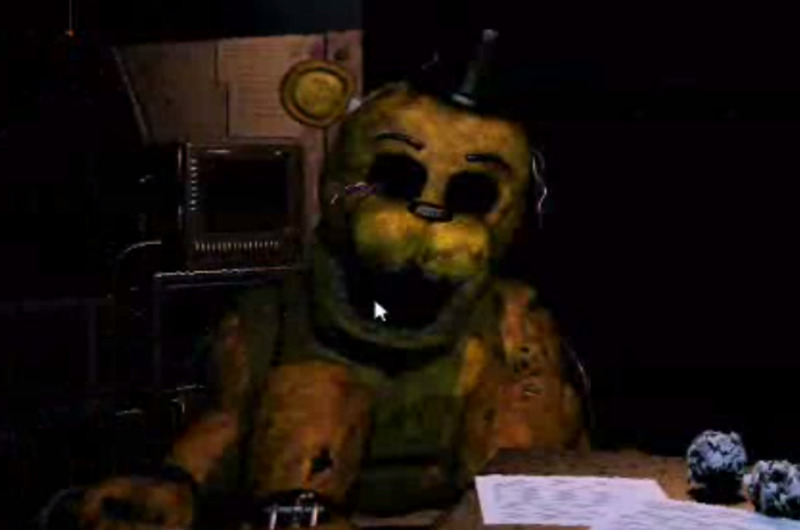 Toy Chica drops by to say hello in Five Nights at Freddy's 2. And, hey, look, she brought a cupcake. How sweet. The overall concept of Five Nights at Freddy's 2 is strikingly similar to the original. You are the night security guard at Freddy Fazbear's Pizza, a pizzeria that caters largely to the kiddy crowd with fun parties staffed by large, friendly animatronics. Problem is, the pizzeria has to close down at night - and when it does, the animatronics get a little, erm, restless. As night security guard it's your job to keep an eye on the animatronics... and hopefully not get slaughtered by them, since they wanna do unspeakable things to adults. The nitty-gritty of Five Nights at Freddy's 2 is a bit different from the original, however, in that you have new ways to protect yourself against the animatronics - as well as new vulnerabilities against which you must protect. We'll start with the good stuff. The camera layout. 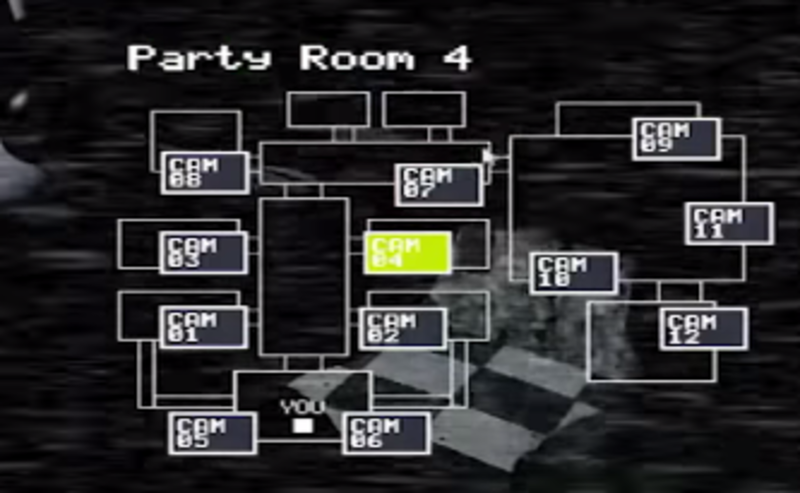 With one incredibly important exception, the cameras will probably go unused in Five Nights at Freddy's 2. Sadface. Cameras. 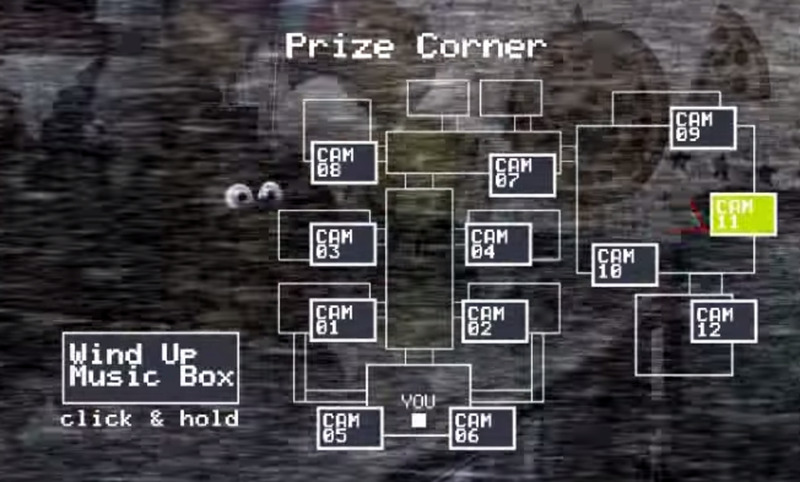 The camera system makes a return, allowing you to view the many rooms of Freddy Fazbear's Pizza, one at a time. You can pull up the camera by pulling your mouse cursor down and to the right side of the screen. Lights. By hitting the Ctrl button you can activate a flashlight at your desk. This will shine down the hallway in front of the desk and let you see what's waiting in the darkness. 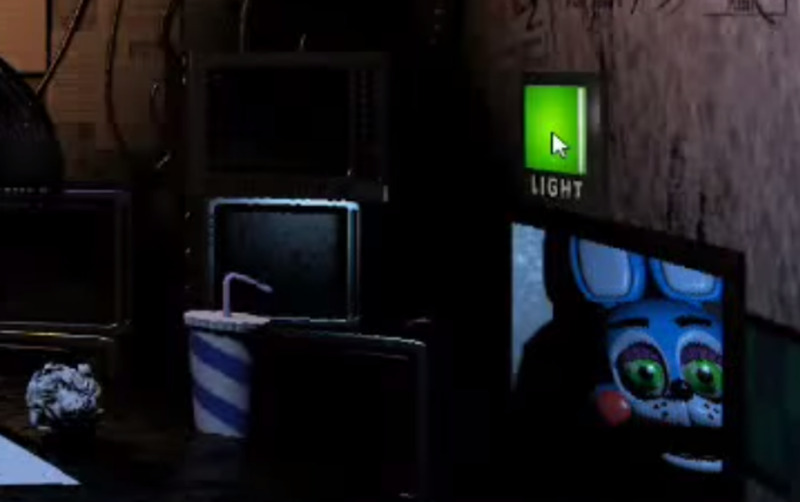 You can also use this button to activate lights while on the cameras and view what's in the other rooms of the pizzeria. Vent lights. There are vents on the left and right sides of your desk. Above each one is a light that will allow you to view whatever's inside. 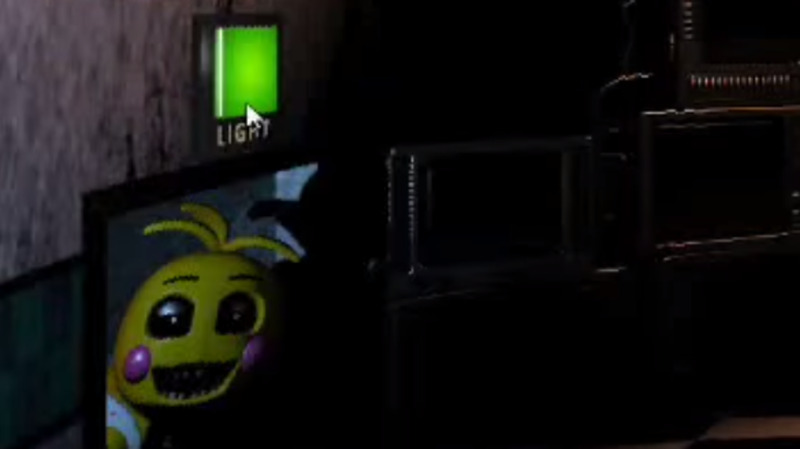 You can hear the animatronics clunking around inside the vents, so be sure to check these lights whenever you think the animatronics might be peering out at you. Freddy Fazbear Head. In order to trick the animatronics you can pretend to be one of them by donning a Freddy Fazbear Head. Lower your cursor to the bottom-left side of the screen to don the mask. Wearing the mask will trick most of the animatronics... most... and it comprises your primary defensive measure on the majority of nights. 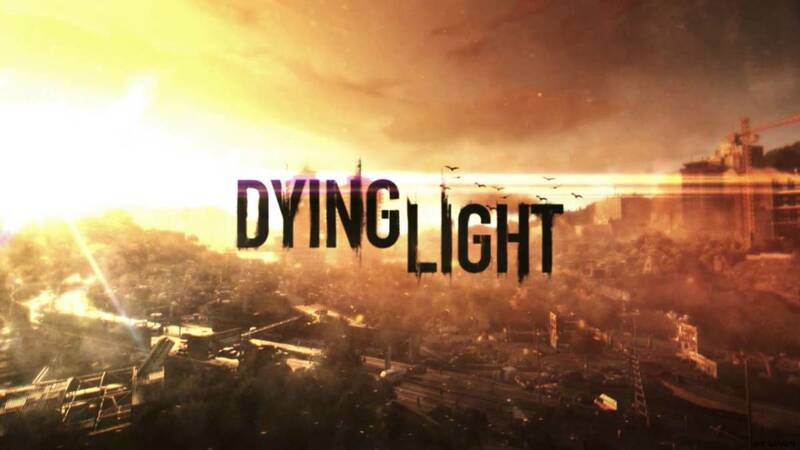 The main thing returning players need to bear in mind is that the majority of lights in the game have unlimited power. 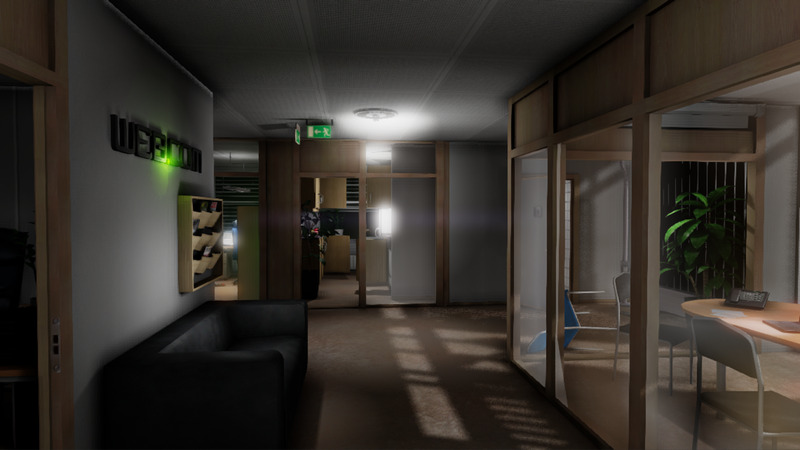 You can flash the vent and camera lights as much as you like - so long as you don't use the flashlight too much. There's a battery gauge in the top-left corner of the screen which indicates the amount of juice left in your flashlight, and if it runs out you'll be staring blindly at the black in front of your desk. So that's the good news. What are you struggling against? Primarily, the animatronics. So many animatronics. As mentioned above, there are eleven animatronics in Five Nights at Freddy's 2, though only ten of them (what a relief) will bother you on the game's normal nights. The animatronics come at you from multiple angles, and each has a specific set of tactics. Understanding these tactics is vital to your long-term survival. Toy Bonnie peers out of the right vent. He's such a cheery champ. A cheery blue bunny with a big bowtie and a vacant smile. Likely the first animatronic you'll see on the first night, Toy Bonnie is a persistent - but fairly predictable - threat. 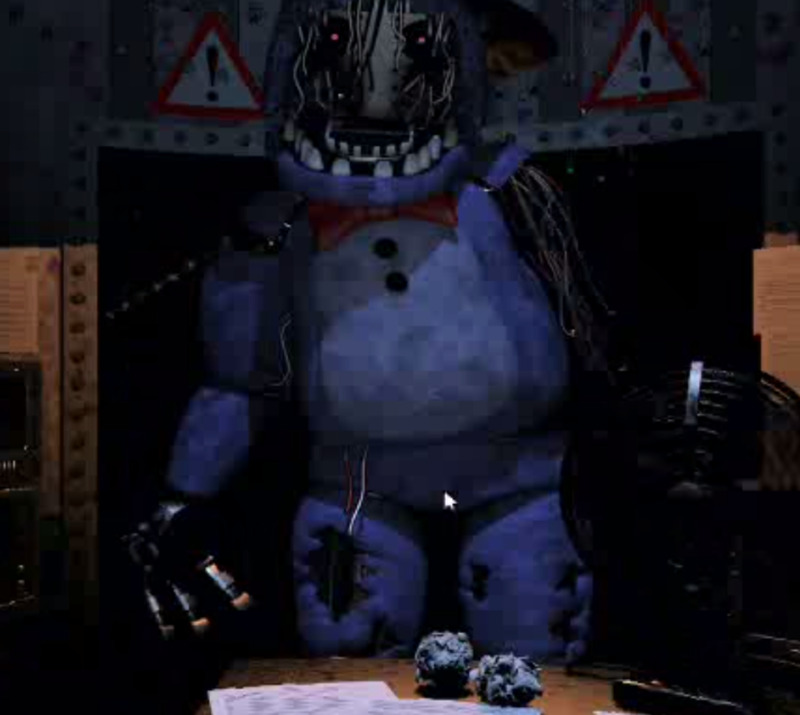 Starting in the same room as the other Toy animatronics on the Show Stage (Cam 09), Bonnie moves primarily through the vents, appearing in the right vent after a fair amount of clunking. 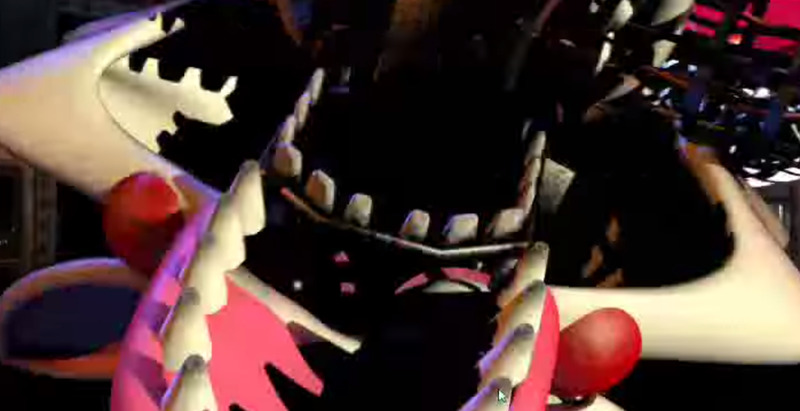 Once you see his face in the vent, pull down the Freddy Fazbear Head immediately. Toy Bonnie's face will then sliiiiiiide past the eye holes, and once his circuit is done, he's gone. Whew. Toy Bonnie is very active early on, though he gets progressively less important as the game goes on. He's a minor threat overall. Toy Chica peers out of the left vent. Creepy bird be creepy. A cheery chicken who can't keep her beak in place. Toy Chica is very similar to Toy Bonnie in her attack, though she appears in the left vent rather than the right. Pull that head on the moment you see her or you're in trouble. Not much else to say, really, as Toy Chica is a bit of a pushover as far as avoidance is concerned - and she doesn't slide past your head's eye holes like Toy Bonnie, to boot. Huzzah. Don't expect to see her much after the first two days. Toy Freddy gives you a faceful. Such smooth skin he has. A roly-poly plastic bear that wears a top hat. The leader of the Toy gang, Toy Freddy is closer in mannerisms to the original bunch of animatronics. Eschewing the vents entirely, Toy Freddy will approach you from the main hallway, appearing first at a distance, then steadily getting closer. Shining the flashlight at him will not dissuade the big bear, but unless he gets close (basically looking as though he's about the step into the office) you can pretty much ignore him. Once he does get that close, don your Freddy Fazbear Head for several seconds to send him packing. Easy enough. 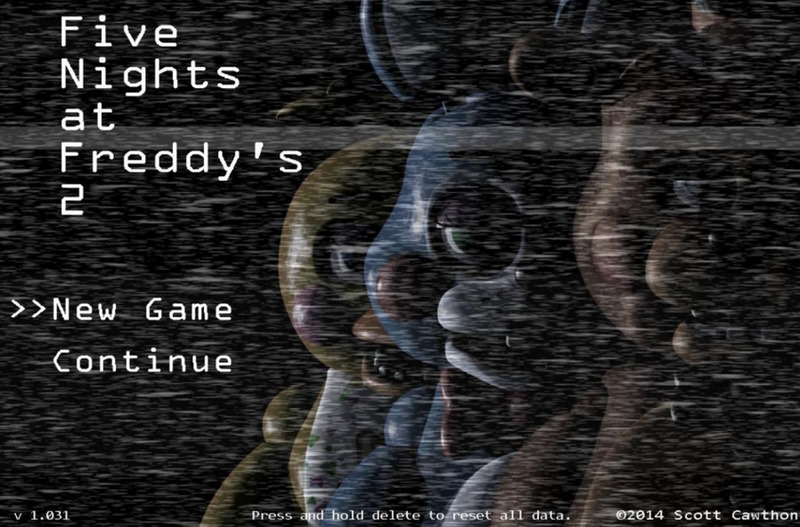 Toy Freddy appears often on the first two nights, then more or less disappears until the fifth. Foxy lunges at the camera. Good times! A ragged, vulpine mangler who likes the halls. 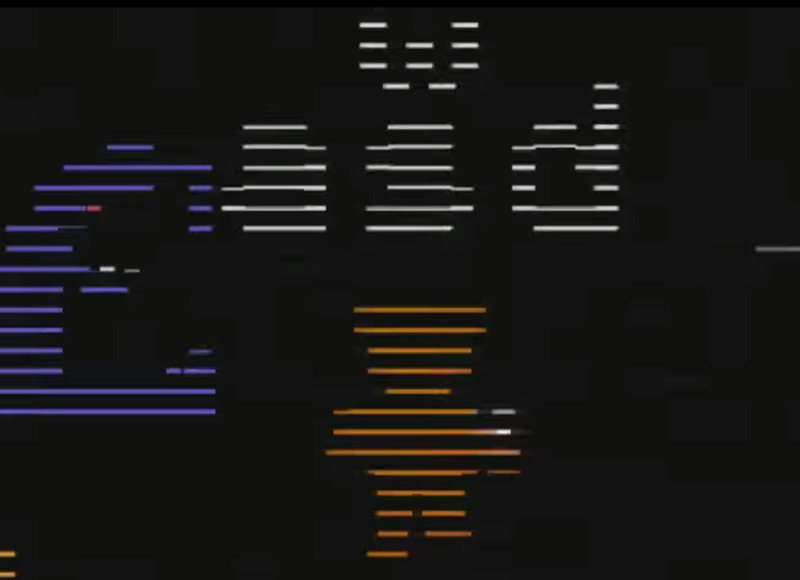 Foxy is the first of the original bunch of animatronics to appear in Five Nights at Freddy's 2, showing up in the hallway from the second night onwards and largely replacing Toy Chica as its occupant. Foxy is a constant fixture of the hallway in front of your desk, and you need to flash your light at him whenever you see him to prevent him from approaching. Fail to do so and he'll get closer... then leap at you. 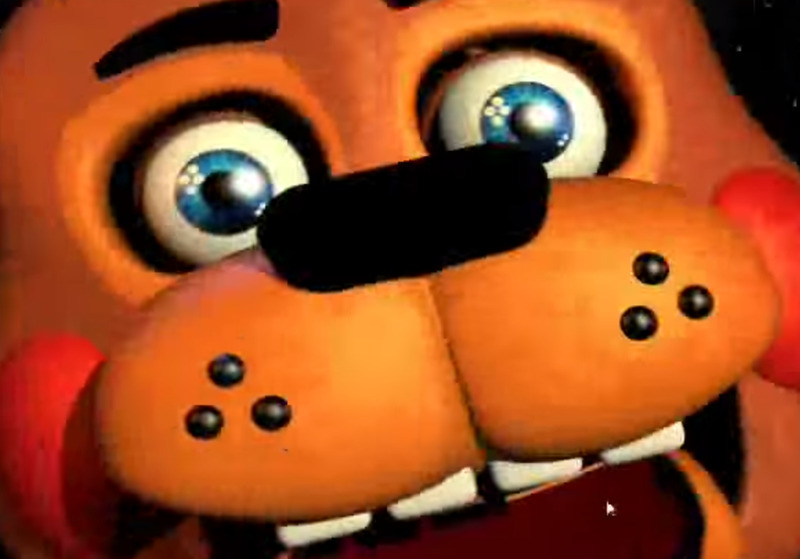 Foxy is not fooled by the Freddy Fazbear Head, and putting it on will not save you. Flash that light like there's no tomorrow. Aaaaand the Mangle does likewise. Foxes are unfriendly beasts in Five Nights at Freddy's. A cheeky fox that has seen much better days. 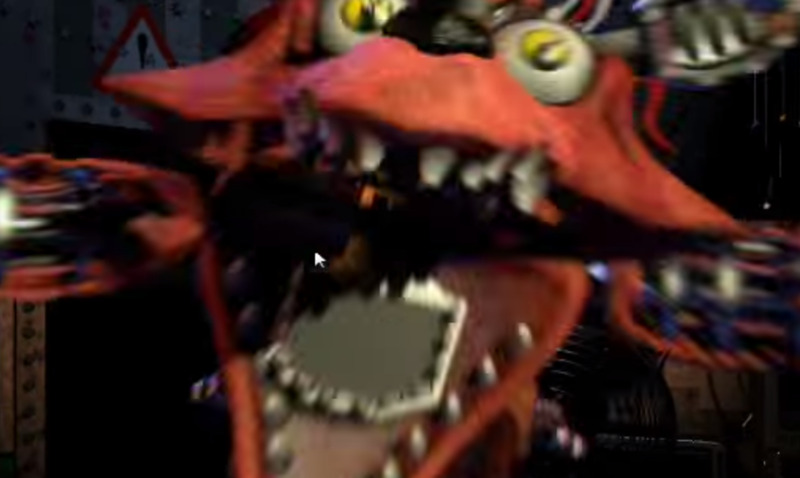 Basically Toy Foxy, the Mangle is a heap of animatronic bits that likes to hang out on the ceilings, and is usually first spotted at the Prize Corner (Cam 11) when it's active. The Mangle will typically appear in the hallways at varying distances, but it is only dangerous when it appears in the vent to your right. Once it does you must put the Freddy Fazbear Head on. Fail to do so - or do so too slowly - and it will hang over your desk for the rest of the night. Its attack will come randomly from that point on, meaning you may be able to survive the rest of the night... but probably not. The Mangle emits a high-pitch static sound whenever viewed on the camera, and will do so when it's in the vent next to you, so make sure to shove the head on whenever you start to hear static and you're not looking at the cameras. Balloon Boy is in the office. You will come to hate this child more than any other animatronic. A small, cheery boy with balloons and a sign. 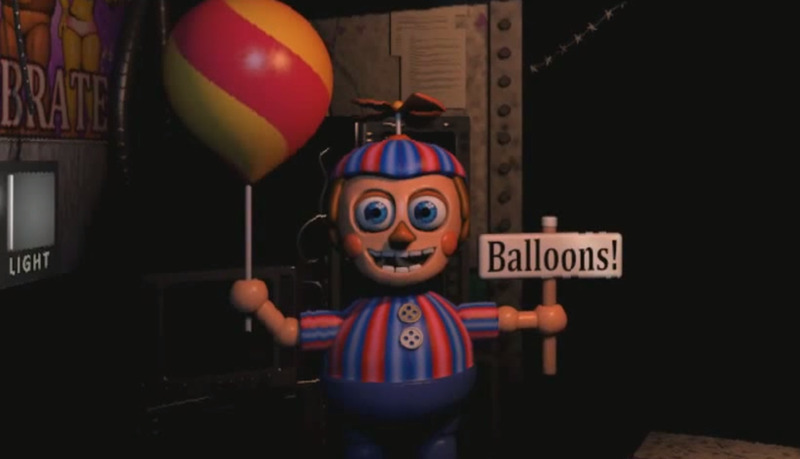 Balloon Boy is the only animatronic who cannot kill you, and his appearance in the office will not result in a jump scare. That said, the Balloon Boy basically kills you, since his appearance in the office will render your flashlight and vent lights inoperable for the rest of the night. You can shove the Freddy Fazbear Head on and try to ride out the remainder of the night, but the chances are pretty good at this point that Foxy will be gunning for your hide. Balloon Boy appears in the left vent, heralded by childish laughing and greetings, and the moment you see him you need to put the head on. Otherwise? You're probably done for. Bonnie hulks over the desk. 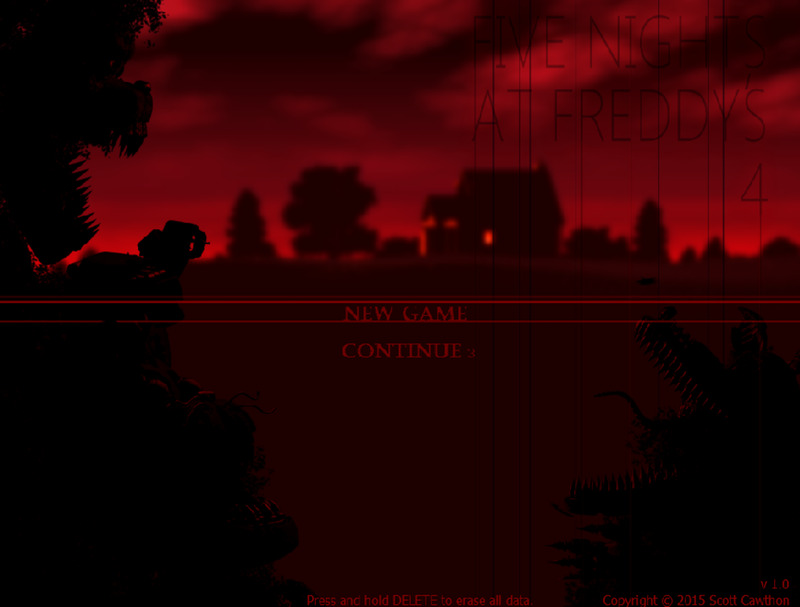 If you see this screen without putting on the Freddy Fazbear Head, you're probably dead already. A purple rabbit that used to have a face. Bonnie isn't looking so hot these days, but he's as dangerous as ever. The hulking rabbit will approach your desk from the hallway, and once he's nice and close he'll typically appear abruptly in front of you while you're using the camera. You must immediately don the Freddy Fazbear Head to avoid being killed, and when I say that I mean immediately. You have maybe a second and a half to do it. Fail and he'll get you a few seconds later. Bonnie's appearance marks a more difficult section of the game, forcing you to swap into the head virtually every time you finish with the cameras. Chica moves in for the kill. Nice dental work. A massive, unfriendly-lookin' bird. 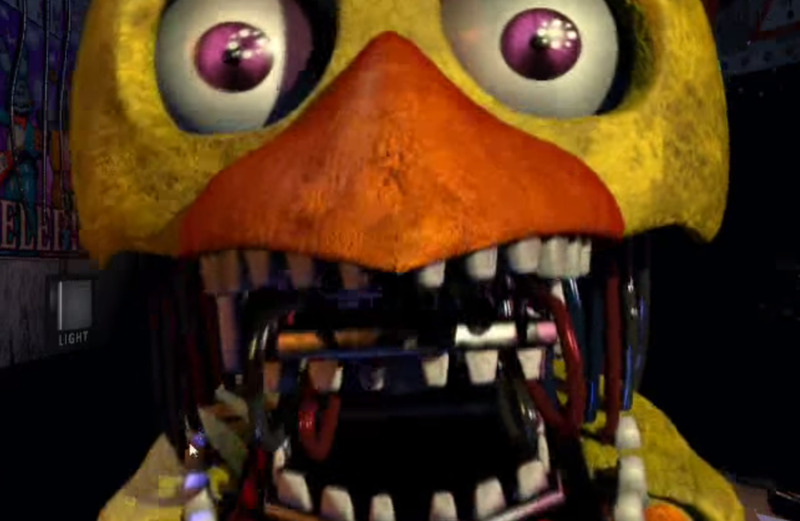 Chica is as disturbing as the animatronics get, and she'll start to dominate the lineups from the third night onward. Like Bonnie, Chica comes at you from the front - but you will seldom see her before she pops up in front of your desk. Don the Freddy Fazbear Head within a second or you're toast. Once you get the hang of swapping between cameras and head, Chica and Bonnie are virtually identical to one another in terms of attacking. Freddy leans in for a hug. He's so friendly. A big, fluffy, degrading bear. 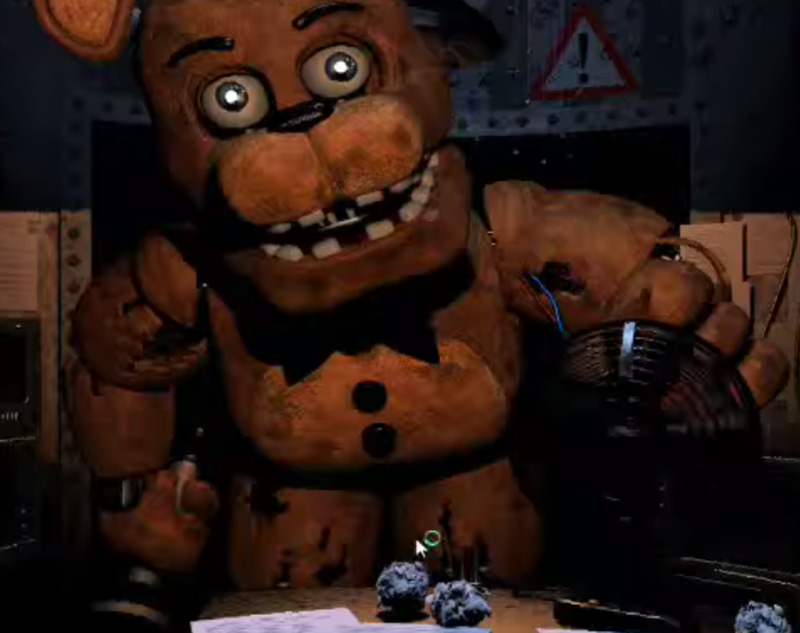 The mascot of Freddy Fazbear's Pizza, Freddy is the same as Bonnie and Chica in that he'll appear abruptly in front of the desk, forcing you to don the Freddy Fazbear Head immediately to avoid his wrath. That said, he also appears at the entrance of the office, and his posture is close and intimidating enough that it's tempting to throw on the head right then and there. Don't do so until he's right in front of you. 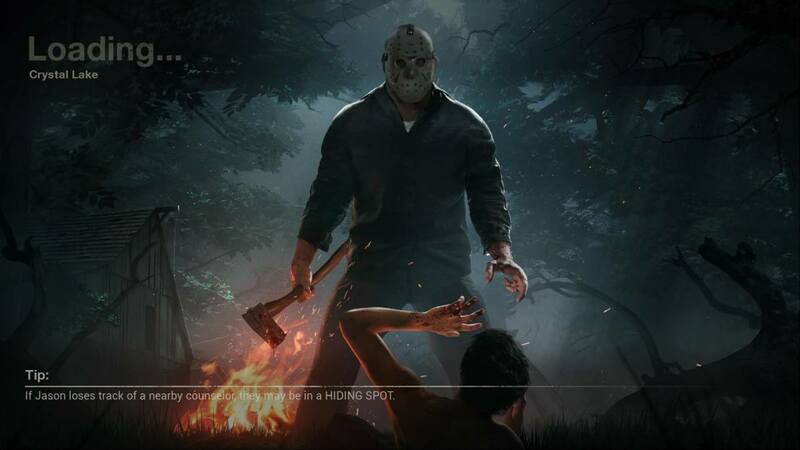 Freddy doesn't attack until he's a few paces away from throttling you, and any other gestures to fend him off will just be a waste of time. Fortunately, Freddy doesn't seem to come out as often as the other animatronics, so you'll face him less often. Keep this music box wound at all times or bad things will happen. Very bad. A spindly, marionette-esque animatronic with a mask for a face. The Puppet is your greatest and most consistent nemesis in Five Nights at Freddy's 2, as it will bother you from the moment you set foot in the pizzeria. On the first day you're told by the Phone Guy to constantly wind a music box in the Prize Corner (Cam 11), and to keep it wound at all times. He hints that it may keep all of the animatronics busy, but in truth it will only keep the Puppet out of your hair. If at any point the music box stops playing music - and you can tell when it's winding down, thanks to a warning sign in the bottom-right corner of the screen - the Puppet will emerge from a nearby prize box and begin moving towards the office. You can't stop it at this point, and the Freddy Fazbear Head will not trick it. All you can do is pray that it does not reach you before the night ends, which it probably (almost certainly) will. Always wind the music box. And we still don't really know what this thing is. Huzzah for mysteries! A dumpy bear costume of questionable origin. 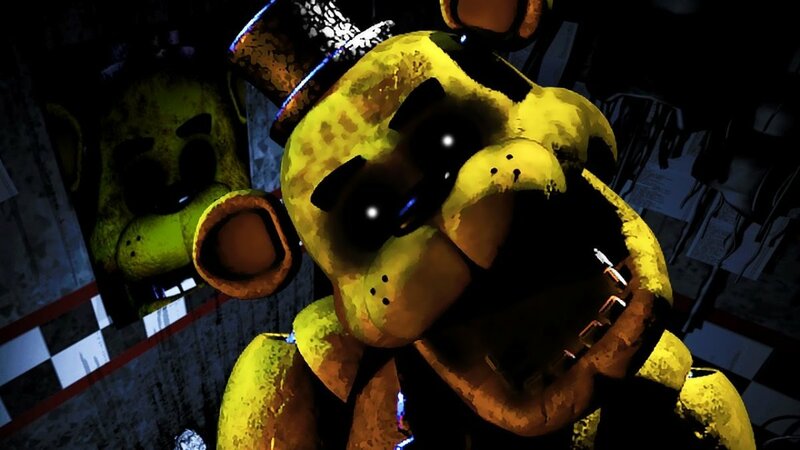 Though not a threat during the first five nights, Golden Freddy will begin to pop up on the sixth night whenever you pull the monitor up, either appearing in the hallway or in front of you in the office. Whenever the suit appears, regardless of where it is, you must immediately put the Freddy Fazbear Head on. You have about as much time as you would with any of the other old animatronics. Fail, and, well, you get the idea. The meat of Five Nights at Freddy's gameplay takes place over the titular five nights. As you might expect, each progressive night is more difficult than the last, with more animatronics to fend off, less battery power for your flashlight, and a music box that expires more quickly. You'll need some ridiculous reflexes to make it all the way to the end of the fifth night... and beyond. Though the first night is still fairly easy, it's not nearly as easy as the first night from the original Five Nights at Freddy's. There's a very real risk of dying if you aren't careful. You have two tasks on this night: watch the vents and keep the music box wound. The hallway is no great concern as of yet, as Foxy doesn't become terribly active on this night. Listen to the phone call, check your vents periodically, don the Freddy Fazbear Head if you see any animatronics staring back at you, and wind the music box whenever you have a free moment. The music box degrades so slowly on this night (you won't even really have to worry about it until the Phone Guy mentions it) that it's not a huge issue. Night 2 is a decent bit more stressful than Night 1. Not only do more animatronics start to wake up and bother you, the music box degrades more quickly than it did before. You'll need to be much quicker on your toes to stay alive. Start to get into a routine at this point: check the vents, check the hallway, and wind the music box. Repeat in roughly the same order. It is imperative you flash the hallway from time to time, as Foxy gets rowdy on this night, and if you don't shine a light on him now and then he'll attack you from the front and take you out. Perhaps the greatest irritant on this night is the Balloon Boy, who can take out your light and expose you to attack from Foxy. Be sure to check your left vent whenever you hear giggling. He's usually not there when he giggles or speaks, but it's best to be sure. Throw on the Freddy Fazbear Head if he's there, then wait to hear thumping in the vent to confirm that he's left. You may also run into the Mangle on this night, despite it being introduced formally on Day 3, though you don't need to worry about the thing unless it's in the right vent. If you hear a hiss of static, throw the head on and wait for it to go away. Now the game gets mean. Night 3 sees the end of the Toy animatronics for a little while, pushing them aside in favour of the older, meaner dudes. (Though you may still see the Toy animatronics occasionally. It's just not likely.) Bonnie, Chica, and Freddy are rather terrible opponents, especially when thrown into the mix with Foxy, the Mangle, Balloon Boy, and the ever-present threat of the music box. Past this point you shouldn't attempt to look at any camera but Cam 11. So long as you only flash the hallway once on each pass, assuming Foxy isn't there, you should make it through the night without running out of battery power. Night 4 is pretty similar to Night 3, only the animatronics have become more vicious and aggressive. Expect to run into the older animatronics a great deal more often, making the Freddy-Fazbear-Head-after-looking-at-the-cameras trick all the more indispensable. Be sure to check the hallway more often, as well, as you can often spot Bonnie and Freddy skulking towards your position well in advance. Foxy is much more aggressive on this night, making the occasional hallway check all the more important. Overall the fourth night isn't that different from the third, but it is more fast-paced and difficult, especially given the degrading quality of the stupid music box. Vicious, pure and simple. Night 5 is almost as harsh as they come, and for one terrible reason: every animatronic in the pizzeria is now gunning for you. Though inactive for Nights 3 and 4, the Toy animatronics abruptly make a return on this night and mix it up with the older crew. You'll have a much harder time jumping from vents to hallway to music box to Freddy Fazbear Head and back again without biting the dust. Nevertheless, the procedure outlined on Night 3 continues to work here - you just need to move all the more quickly to get it done. It is vital that you keep the music box wound as much as possible, as the animatronics in the vents (particularly Balloon Boy) like to linger in place for long periods of time. You may have to risk death by hopping quickly into the camera to wind the music box. It's worth noting here that the old animatronics are pretty good at wasting your time, not just because their abrupt appearances force you to shove on the Freddy Fazbear Head, but because the lights take a little while to come back on after they disappear. Don't wait for the lights to fully return after they flicker. As soon as the offending animatronic vanishes from sight, take the head off and get back to work. Only your initial hiding action counts towards your survival, not what comes after. Yep, this game has a Night 6 as well. A significant jump upwards in terms of overall difficulty, Night 6 is the hardest challenge in Five Nights at Freddy's 2, save for what comes next. Your tactics won't change at all, but you'll have to balance vents, hallway, music box, and mask quite effectively to survive the whole night. Relying on sound cues (static, giggles, etc.) will help keep you alive more than ever. The only new animatronic to pop up on this night is Golden Freddy, and it presents a significant threat - though one you can easily handle. If you spot it in the hallway, at any distance, immediately don the Freddy Fazbear Head. This should make it fade out of view fairly quickly. Once it's gone you can get back to business as usual. Make the game even worse? Let's do it. Once you've completed the sixth night you'll unlock the Custom Night, which, similarly to the original Five Nights at Freddy's, allows you to manually set the difficulty level of the various animatronics. Setting an animatronic to zero will render it almost comatose during the playthrough; setting it to twenty will make it extremely, extremely aggressive. Note that a zero setting does not completely stop an animatronic from moving; it simply makes their inclusion in the round quite unlikely. 20/20/20/20: Freddy, Bonnie, Chica, and Foxy are all set to twenty. A throwback to the original game, this mode allows you to ignore the vents but forces you to jump into the Freddy Fazbear Head constantly after checking the music box. Foxy will work danged hard to drain your flashlight, as well, but keep a constant eye on him. You get a star for completing this preset. New & Shiny: Balloon Boy, Mangle, and the three Toy animatronics are set to ten. This challenge is quite similar to Day 2, and isn't very difficult. You get a Toy Bonnie figure for completing this preset. Double Trouble: Bonnie and Toy Bonnie are set to twenty. This challenge allows you ignore the left vent, but checking the right vent constantly is a must-do. The Freddy Fazbear Head will get quite a workout. You get a Bonnie doll for completing this preset. 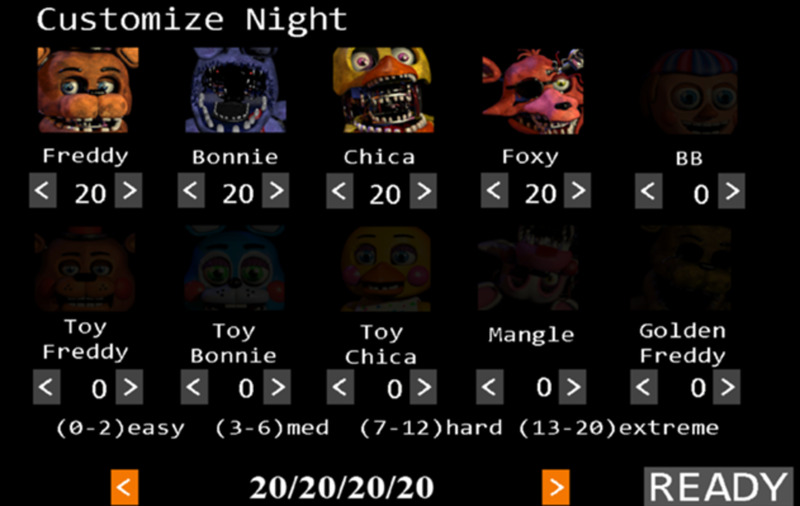 Night of Misfits: Balloon Boy and Mangle are set to twenty, while Golden Freddy is set to ten. You'll have to check the vents constantly on this one, and the hallway occasionally. That said, you can largely ignore the right vent, as Mangle's static will herald its arrival quite nicely. Expect an excess of childish giggling. You get a Balloon Boy doll for completing this preset. Foxy Foxy: Foxy and Mangle are set to twenty. You'll have a vulpine presence in the hallway for most of the game, and Mangle will watch you from the right vent at every opportunity. Swap between the two, as well as the music box, in a constant loop. You get a Foxy doll for completing this preset. Ladies Night: Chica, Toy Chica, and Mangle are set to twenty. This challenge is pretty much a high-pressure version of the normal game, with animatronics coming at you from both vents and up front. Play the game as you would on a normal night, though Mangle's static will allow you to ignore the right vent if you pay attention to audio cues. You get a Chica doll for completing this preset. Freddy's Circus: Freddy and Toy Freddy are set to twenty, while Foxy, Balloon Boy, and Golden Freddy are set to ten. Another relatively normal night, though you'll experience some hectic movement from the front. Using the flashlight to check the hallway for the Freddies should keep Foxy at bay. Keep an eye on the left vent for Balloon Boy, as he'll ruin the night for you quite adeptly. You get a Freddy doll for completing this preset. Cupcake Challenge: All of the animatronics are set to five. You have challengers coming at you from all sides, but they're fairly docile. Think of it as a watered-down sixth night. You get a cupcake doll for completing this preset. Fazbear Fever: All of the animatronics are set to ten. A doubled-down version of Cupcake Challenge. This one is roughly on par with the sixth night. You get Freddy's microphone for completing this preset. Golden Freddy: All of the animatronics are set to twenty. The mother of challenges, Golden Freddy will force you to work at inhuman speeds to survive attacks on all sides. The most dangerous part of this night is knowing when to safely wind the music box; wait until after you've checked the vents and verified that they're clear of animatronics. That said, don't wind it for too long - a few seconds is all you can spare before you need to be checking the hallway and vents again. Check this article for a good lowdown on how to survive the night. You get a Golden Freddy doll for completing this preset. In addition to everything above, you will occasionally play a brief minigame whenever you lose a night. These minigames aren't terribly challenging (okay, they're not challenging at all), but they serve as vague flashes of the sordid history of Freddy Fazbear's Pizzeria. You won't see them too often, and they have no effect on the game otherwise. Which animatronic has killed you the most times in Five Nights at Freddy's 2? Golden Freddy Says: Why Does Toy Freddy's Jumpscare Very Common? i only play fnaf now. it is so adicting!!!!! i hope scott makes more. Woooah.....finally I'll be able to beat fnaf 2! This is a great explanation. I heard a third game might be coming out soon. I think it's a three-way tie between Foxy, Bonnie, and Chica for me. The old crew is merciless. Everybody was killed the most by Foxy, I bet!